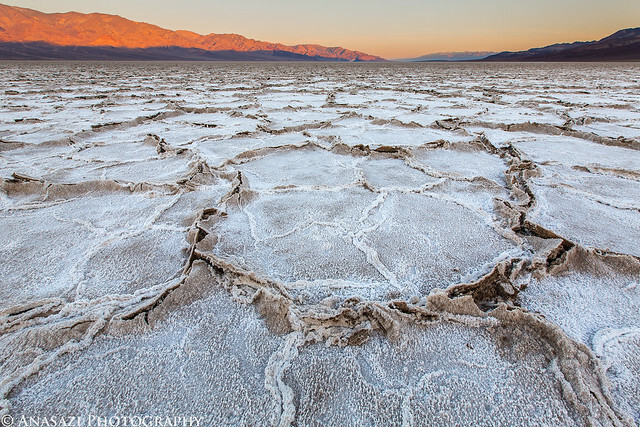 The 11,049 foot Telescope Peak and the rest of the Panamint Range stand tall over Badwater Basin (282 feet below sea level) at dawn. Sunlight strikes the Panamint Range across Death Valley. 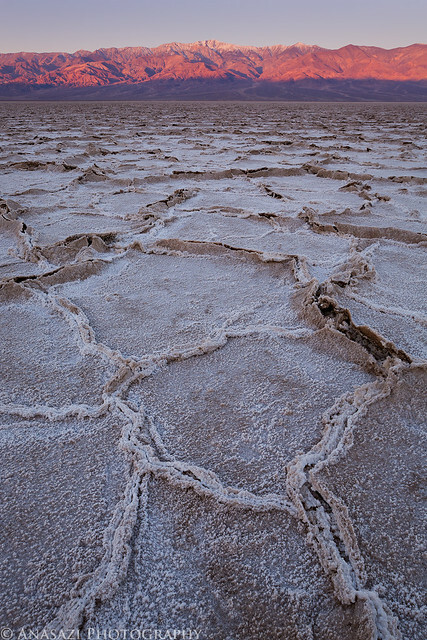 There were endless compositions with all the different, yet similar, shapes in the salt. This large polygon caught my eye as I hiked around the area. My alarm woke me up a few hours before sunrise on Monday morning. 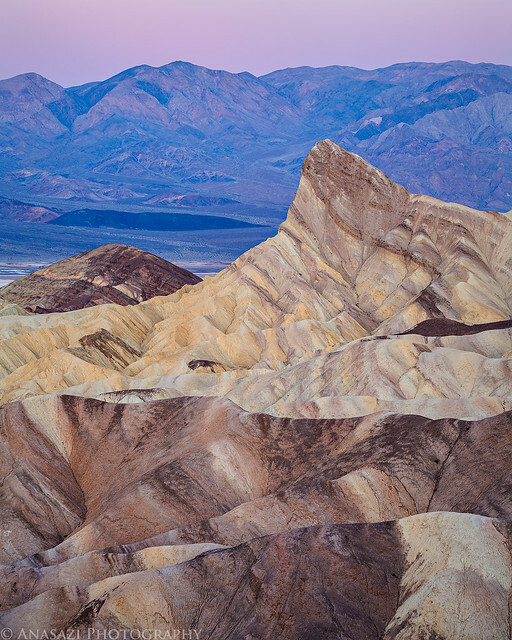 I quickly got my camp loaded back in the Jeep and started the short drive over to the popular Zabriskie Point. As usual, I was the first to arrive with plenty of time to scout the location in the dark. I guess I should mention that it was my birthday. I had purposely planned this trip to coincide with my birthday, and I couldn’t think of a better way to spend the day. 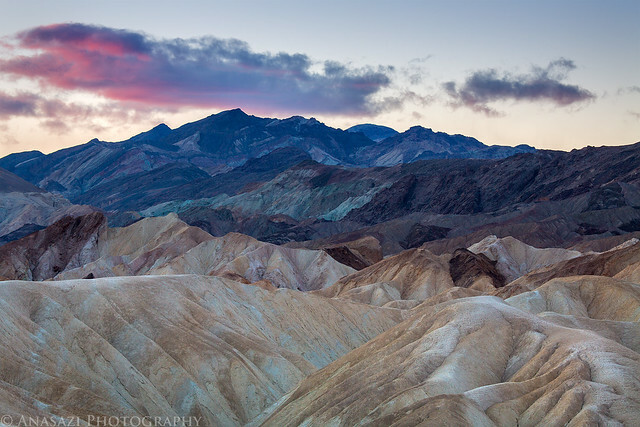 Looking over the badlands from Zabriskie Point shortly before the sun would rise for the day. 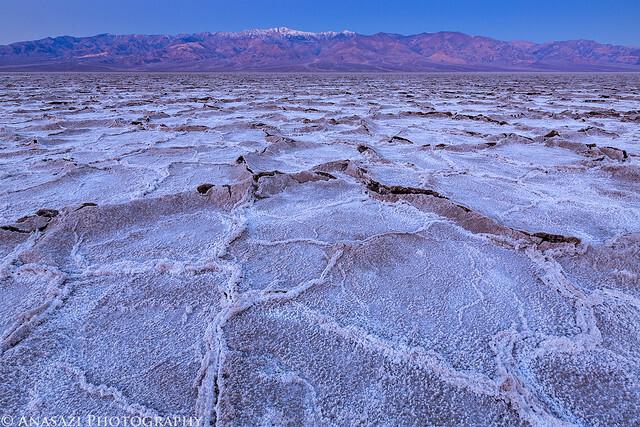 The prominent Manly Beacon, the Panamint Range and the Earth’s shadow come together for this scene. 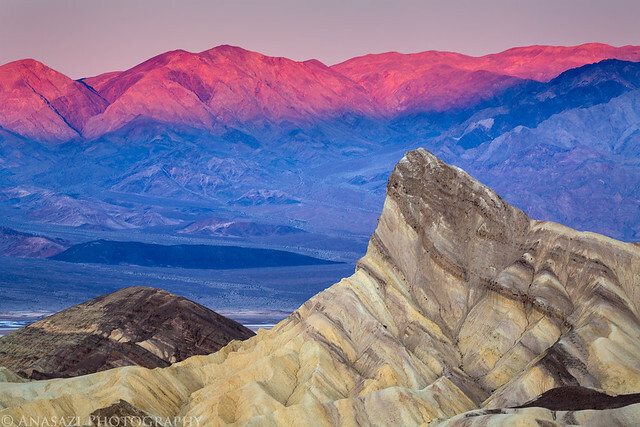 First light on the Panamint Range on the other side of Death Valley. On my way to the Falling Man site I drove right by Devil’s Throat, so I stopped for a quick look. 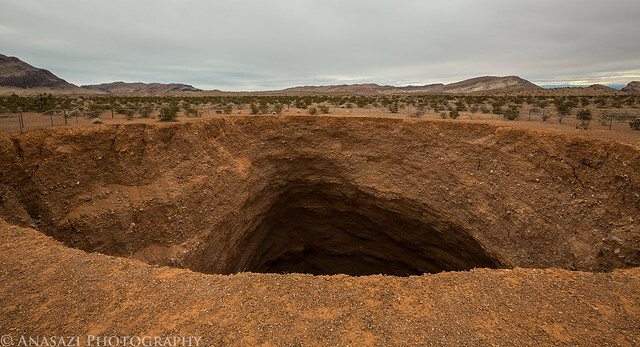 It’s a giant sinkhole in the desert floor. This is not a good photo, but I’m posting it up anyway since I bothered to stop here. When I made my plans to spend the first weekend of my trip in the Gold Butte region I really thought that the Kohta Circus petroglyphs were going to be the highlight of my visit. I was wrong. I had a lot more fun exploring the area around the Falling Man petroglyph. Not only were there petroglyphs to be found everywhere I looked, there was also colorful sandstone all over the place. It was like walking through a colorful maze searching for rock art around every corner! I spent more time in this area than I had anticipated and look forward to returning again in the future. A photo of colorful sandstone in a small alcove reminiscent of scenes found at the Valley of Fire. To access the rock art I had to first crawl through this passage in the rock. The petroglyphs lead the way. 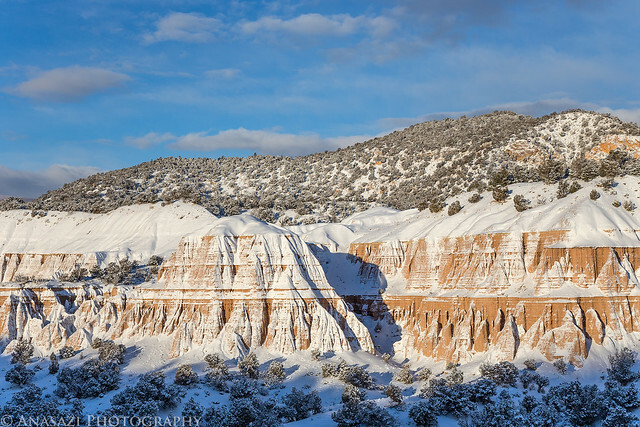 It’s been an unusually long and cold winter this year in Grand Junction. That’s why I’m glad I started planning my first trip to Death Valley a few months earlier. It would be nice to get out hiking and camping in temperatures that were a bit warmer than back at home. Though my main destination on this week-long trip would be Death Valley, I planned on spending the first weekend exploring a few locations in Nevada. 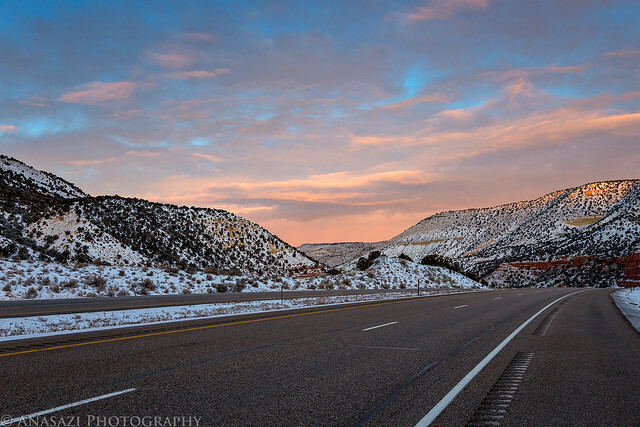 On Saturday morning I left home bright and early and started my drive west. As I approached Salina the sun started to come up and painted the clouds above a pink hue. I pulled over for a quick photo over the interstate. A layer of fresh snow that fell overnight coated the landscape and caught my attention. When I reached St. George I needed to get out of the Jeep and stretch my legs a bit. I drove over to Anasazi Ridge along the Santa Clara River and hiked to a few petroglyphs. Two large rectangular-bodied bighorn sheep. 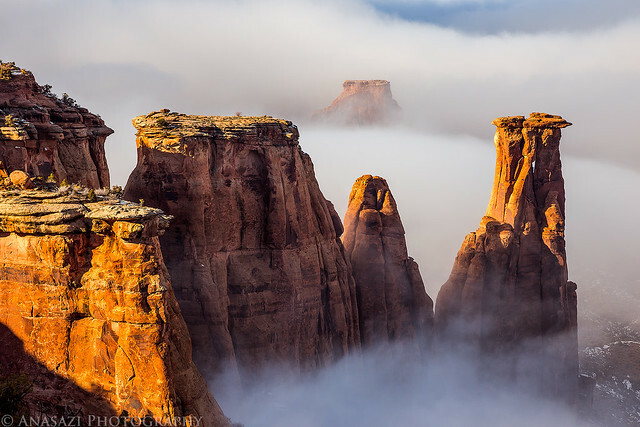 By now I’m sure many of my regular readers are tired of seeing photos from the Colorado National Monument. For those of you who might feel that way, I’m sorry to say I have another trip report of photos taken there. Better stop reading now! After spending over five hours photographing the inversion layer in the Monument on Saturday I had no plans to return on Sunday. However, in the afternoon I noticed the clouds that had been hovering over the Grand Valley all day were finally beginning to break up. I couldn’t resist, so I grabbed my camera and drove back up there. I’m glad that I did! 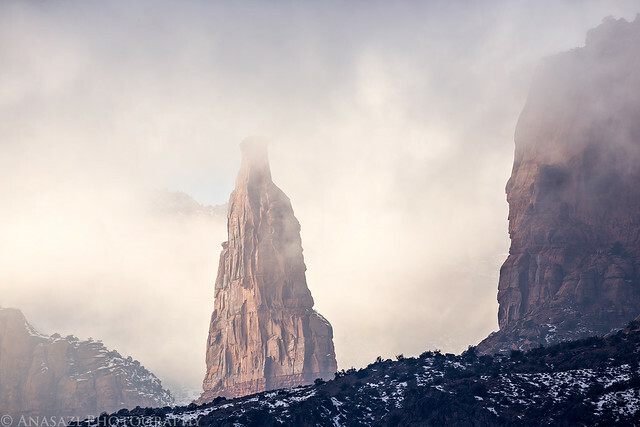 As I was driving to the Fruita entrance I noticed the clouds hanging in the canyon obscuring the view of Independence Monument. I found somewhere to pull over and switched to my long lens for a closer look. 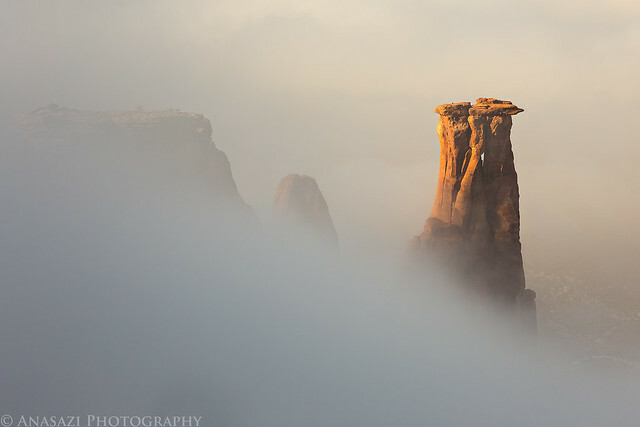 When I reached the Monument Canyon view I was pleasantly surprised to find many dynamic clouds in the canyon below.